I'm going to tell you what I'm watching this season, and you can either cringe (like I would if you told me you were watching NASCAR, or The Walking Dead), or you can celebrate the fabulousness of my TV viewing choices. I don't always watch these on the nights they air because sometimes I'm "working", which means driving, which means no TV watching. If we're driving and I can't stop (or Ed is cracking the whip), I'll watch them at a later time online or on my iPad. The only one I NEVER miss on the night it airs, is Glee. The Voice: I can't get enough of singing shows and what I love most about this one is that when the judges choose the contestants, they can't see them. And even the people that aren't they great, are still fabulous. I have so many favorites this season already, I'm going to have a hard time choosing a winner. Perception: I love Eric McCormack from his Will & Grace days. This is a completely different role for him and I love him in it. Major Crimes: A spin-off of The Closer, I watch this only if I remember. It's not a must, but if I'm flipping and see it on, I'll stop and watch. Modern Family: I can't quite decide who I love most on this show but I think I'm going to have to go with Cam,. 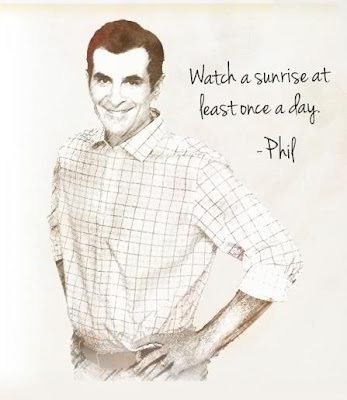 But Phil's a close second. I love this kind of TV show because it keeps me laughing almost all the way through. Nashville: A singing show set in my favorite city of all time?? I love that I know the places I see in the aerials of the show. I love that I know where Tootie's and the Ryman is. I love seeing the batman building in the opening of the show. I love the drama and romance and music. Although Hayden Panettiere and Connie Britton are the names we know, I think Clare Bowen and Sam Palladio are going to be breakout stars on the show. Oh! Also - my friend Vicki's kid's swim coach is also on the show. Right now he just has a minor role, but I got to see his scene and there he was, front and center. Hi, Jack! Grey’s Anatomy: This I've been watching for so long, I can't give up. Sometimes the story line is lame, but most of the time I wind up crying. Ed thinks I'm crazy when that happens. Scandal: Another series by Shonda Rhimes that I just LOVE. I'm not a huge Kerry Washington fan, but she's growing on me. It's very edge-of-your-seat. Project Runway: This is crafty on steroids. These people are talented under pressure and turn out some fabulous (and sometimes horrible) creations. Sometimes, I think I could be on this show. Glee: There's nothing more I can say about Glee that I haven't said already. I love this show. EVERY SECOND of it. The Mentalist: Simon Baker. I don't think anything else needs to be said. A practically perfect list if I do say so myself.